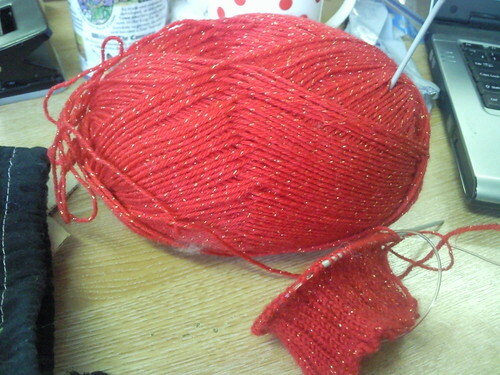 I was seduced by the sparkly, seasonal sock yarn in GK at the weekend and had to buy it. I was the first person there who wanted the red, and there was only one ball left, so I got it. I have had to cast it on already because it didn't seem fair to take the last ball of red and then not knit socks with it. And besides, as you see, it is yarn made to be socks. (It's not mouldy, btw, that's just a leftover whisp of Jade Sapphire cashmere which was in the project bag). I am doing the simple ribbed sock pattern which is NOT toe-up, despite my (extremely arrogant, considering I have never previously knitted socks) insistence on this being the best method. I just wanted to get going and this was a simple pattern, freely available. It does remind me a little of my old ribbed grey school socks, but wth - it's retro. 1. Sam's hat. Assistant head at school asked for a hat in her rugby team's colours last year. She's leaving at the end of term. It is now an urgent concern. 2. Secret Santa gift for work. I am knitting some beaded wrist warmers, based on a pattern I made up when I started knitting. I knitted the original out of Debbie Bliss navy cotton angora which (a) didn't show up the cabling at all and (b) had no stretch to it, which is why I am talking about the original in the singular, since I never made the second one. I never wrote down any instructions, either. But I'm using plum coloured Kid Classic by Rowan and silver beads, and have enough sense now to be knitting the beaded stitches TBL on the next row, which saves a lot of shuffling beads about. 3. Parpy Jo's scarf. I finally got over myself and started adding the knitted on border at knitting group on Saturday, and it's really not as scary as I suspected it would be, although I did have to buy some sharper DPNs. I don't know why, since I could hav just used any old needle - it dosn't need DPNs. But oh well. Parpy Jo has returned from her Russian holiday afianced (hurrah! ), and I am seeing her next Sunday, so this one is the most pressing of them all. 1. Delia's mincemeat nut strudel. YUM. 2. Something with chestnuts and chocolate. Chocolate chestnut cheesecake, probably. Or chocolate chestnut trifle. 3. St Clement's roulade. I can't even remember where the recipe for this comes from, which may prove to be an issue. It is some sort of citrus sponge, filled with lemon curd, passion fruit and cream. It is very tasty. 4. Blueberry bread and butter pudding in the slow cooker. Made with double cream and croissants. This is so deacadent and calorie crammed that I really can't justify making it any other time. I looked forward to it all year. It's best made overnight ready for Boxing Day. 5. Christmassy cupcakes. I would like to do some experimenting and come up with a really Christmassy blend. I am thinking, lots of spices, a cranberry filling, and an icing flavoured with Liquid Christmas spirit (the name of which escapes me now...it's Czech, and in a blue bottle with a yellow label).